This Nottingham Playhouse production is the third in a collaboration across a group of regional theatres to promote inclusive theatre. Known as Ramps on the Moon, the initiative sees each theatre in turn producing a touring drama featuring able-bodied, disabled and deaf performers in a fully inclusive show. 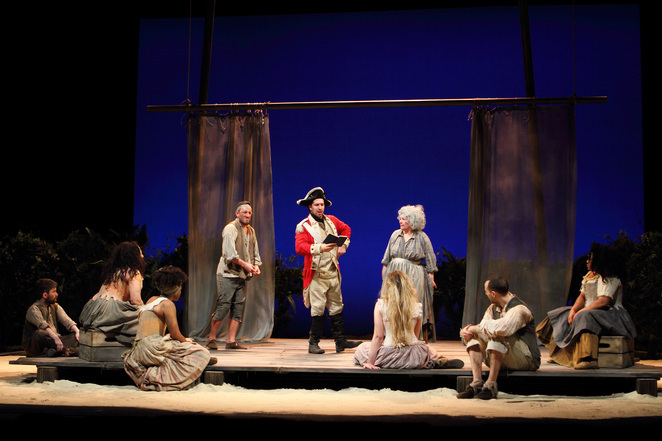 This time the choice is Timberlake Wertenbaker's Our Country's Good which takes us to an 18th century penal colony in Australia where the newly arrived governor decides the way to motivate the prisoners is to put on a play. Wertenbaker's work may be a comedy but it's a comedy with lots of pithy messages about people, their relationships to each other, justice and injustice. Their play becomes a political hot potato between those in favour and those against and its success becomes a personal mission for its director and some of its cast. Based on the novel The Playmaker by Thomas Keneally, the drama blurs the lines between convicts and soldiers as we learn that many of the prisoners are really victims of circumstance and some of their jailors are vicious and vindictive. 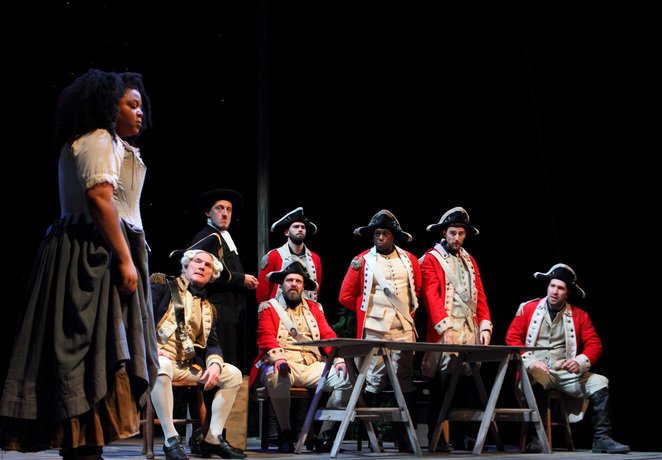 There's a lot packed into this play as it also raises questions of colonisation, the justice system, exploitation of women convicts and the possibility of redemption. But it's also very funny with laugh-out-loud moments – particularly as the various prisoners attempt to stage their play. Tim Pritchett's Second Lieutenant Ralph Clark is the officer in charge of directing the play, which sees him veering from hope to frustration as his cast prove to do anything but what he asks. Opposing him is Colin Connor as Major Robbie Ross who refuses to see that any good can come from giving the convicts any role other than work. There are some lively performances from a number of the cast. Alex Nowak is hilarious as Robert Sideway, who believes he is the Australian Richard Garrick and whose flamboyant stage presence creates some great moments of comedy. Sapphire Joy takes the role of leading lady Mary Brenham which sees her develop from shy to confident and win the heart of her director. Gbemisola Ikumelo plays the recalcitrant Liz Morden whose part in the play and, indeed whose life, is in jeopardy when she is sentenced to hang for stealing food. And Fergus Rattigan has the difficult role of James 'Ketch' Freeman, the prisoner hated by his fellow convicts for agreeing to become the colony's hangman. Like Ramps on the Moon's previous two productions – The Government Inspector and Tommy, this production of Our Country's Good shows how exciting theatre can be when it is inclusive. Directed by Fiona Buffini, the show makes use of silence and signing so the audience is never quite sure who is able to vocalise and who is simply staying silent. The show is also signed and captioned throughout to ensure it's not just inclusive in terms of performers and the creative team but also in terms of accessibility for the audience. With three productions now created, and all three being hugely successful, theatre-goers should hopefully have much to expect from the next three shows.